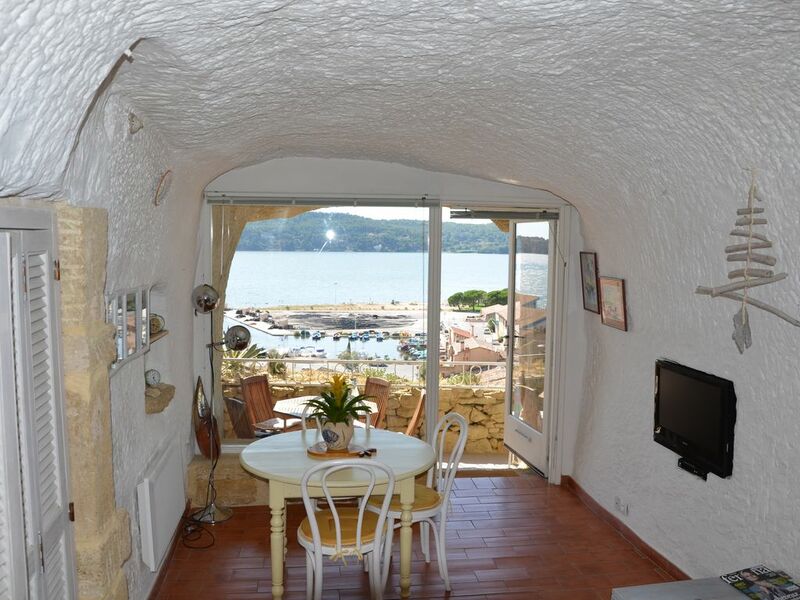 You can rent this property for unusual holidays, in a picturesque dig (troglodyte or 'baumes') on a hill in Baou, Saint-Chamas (13), where the lagoon of Berre dominates as the main tourist site. This small Provençal village (7500 inhabitants), with it fishing harbour and marina, is close to the medieval village of Miramas-le-Vieux, Salon-de-Provence,and Aix-en-Provence. The house is located in a protected place of Saint-Chamas, overlooking the small fishing harbour and marina. There is a superb view, from the terrace, of the lagoon and the village. 2 min walk, you can find shopping facilities and the centre of the village centre, as well as the hill for nice hiking discovering the village. This 60 sq.m house consists of 2 main rooms and small additional cavities (kitchen, bedroom/cabin, and shower room). Temperature remains constant all the year long, 18° (natural air-conditioning), ideal during hot periods, but it is also equipped with electric radiators if necessary. In 1640, a large cave went through the hill from east to west. The house is well lighted during the day. The morning sun illuminates the courtyard, and in the afternoon the sunset illuminates the terrace. This house is very appreciated for clients interested in nature, rock, history of villages, hiking, fishing in the river, and the lagoon (The largest salt-water lagoon in Europe). The uniqueness of this village relies on the troglodyte houses that were dug in the 'safre bleu' on the hill of Baou. Some of these caves (or 'baumes') are natural. The others were created by humans between 1610 and 1650. Three levels of caves spread fro the road bordering the lagoon in the limestone layer where the medieval houses were built. Some of these have been equipped with oil mills. Other serve as ware houses, sheepfolds, store rooms, etc. For everyone who needs a port. The most antique dates back from 1610 to 1616. They became inhabited at the end of the eighteen century. This house has belonged to the Bras-Ravel family for 103 years. It served as a henhouse for grandfather, and was used as a shelter during the war of 39-35 and a house since the 50s. It has been restored by the owner (small sons) beginning in 2000, and it has been turned into a holiday house for family and friends. Recently, a private parking space has been built 5 m away from the entry. The house, due to its location, is very sunny and ventilated, without humidity problems. On the edge of the lagoon, you will find, depending on the season, swans, flamingoes, gulls, and migratory birds in the humid zone. The shower room has a shower cubicle, a hand basin with mirror, a WC, shelves, electric heater, and washing machine. Thee window faces the courtyard. This charming house was exactly what we hoped it would be. It has a wonderful character all through the house. The layout is perfect. It has all the amenities you need for a relaxing holiday. The view is absolutely incredible. It was spotlessly clean when we arrived and the owners have great customer service. We would definitely recommend this house to anyone. There is a private parking space close to the house. 10 min away from Salon-de-Provence, 20 min away from Aix-en-Provence, and 40 min away from Marseille and Arles.